We hope everyone had a great Thanksgiving and we want wish everyone a Merry Christmas and Happy Holiday Season! The fires in California have been devastating. With the loss of life and property so wide spread, it is a true disaster. In California the fires earlier in the year were in sections of California that didn’t affect a large segment of the population and there was a certain amount of complacency. But, the most recent fires in Malibu and especially Paradise have embedded a large part of the population with haze and smoke. For over a week, the entire San Francisco Bay area and the Northern Central Valley dealt with the smoke pollution. Thankfully, these fires did not occur during the growing or harvest season and will hardly affect agriculture. The rains are now upon us. It has cleared the air and relieved the potential of more fires in the near future. Hopefully, the rains will continue through the winter and prevent drought conditions. From a Forbes article by Thomas Pellechia, the wine business market research and consulting firm BW166, LLC recently reported that in the twelve month period ending in October 2018, total wine sales in the U.S. rose nearly 5%, of which almost $48 billion accounted for domestic wine sales, an increase of 4%. What is even more important for wineries throughout the country is that DtC (Direct to Customer) shows significant growth. In that growth, second place are red blends that sell between $30-$59.99/bottle. Most of the upward wine buying trend had been in the under $20/bottle for quite some time, but this latest report indicates that steady economic growth over the past few years may be behind the development of wine buyers with more disposable income willing to spend up. In fact, red wines priced $30/bottle and up account for 80% of DtC blended red wine shipments. For more than twenty years, we have been attending Winery Conferences all over the country. As yet, we have not made any plans for the 2019 year, other than attending for a day to the Unified Wine & Grape Symposium here in California. Over the last few years, new business at these conferences has diminished. It is always a great pleasure to see our customers at these shows, but it is just too early in the year to discuss their upcoming needs. Also, we find that most of our new business comes from word of mouth, the internet through our website, and winemakers who move to new positions and their wineries are growing or they move to a new winery. Last year we visited a lot of customers in a trip to the Mid-West. It was a wonderful and joyful trip that let us visit a customer’s place of business and discuss their individual needs. We like this scenario very much. Maybe a trip to another part of the Country could be panned this year. Please let us now your opinions. 2018 proved to be the biggest shipment year to wineries all over the Country. This increase is to tonnage, number of wineries, and dollar volume. Even though shipments for home winemakers decreased, our total volume increased in all categories. Most grapes ripened later than normal during the 2018 season. We had cool weather in late August and most of September. Sugar levels actually went down for a few weeks or remained the same. This delayed sugar development but had a wonderful consequence-- the grapes developed beautiful flavors and colors. We kept pushing harvesting as maturity developed and were lucky to have picked most grapes before the rain in early October. There were some days that harvest lasted into early evening but it proved to be an excellent strategy. This allowed us to store “delicate” grapes without any difficulty and create efficient shipments with the later Cabernets. Cabernets were almost the only grapes we had to pick after the rain. We waited a week after the rain to harvest them and they proved to be outstanding. This week we are going to start harvesting grapes for the 2018 season. It will be a slow start with some Orange Muscats, Verdelho, and Chardonnay. The following week we will continue with some local (Lodi area) Pinot Noir and a few other black grapes. Old Vine Zinfandels harvest will probably commence on or about August 29-30. Sugars are moving about 2 points per week. The whole scenario (harvest) is at least a week later than last year. One terrific quality that is starting to show up in this year's crop is the development of some potential excellent color in the grapes. The days are warm to hot, but the evenings are cool in Northern California. With the development of 2 brix points per week in the grapes, we have an ideal situation. Last year we changed the source of our Chardonnay. We started picking a vineyard where the Chardonnay is thinned to a limited amount of bunches per vine. The vine was still grown with a good canopy. We ended up with sweet solid bunches with distinctive flavor and condition. We had such great success with the grapes that most wineries who bought the grapes last year doubled their order this year. Upon investigation this year, we found out they were Robert Young Clone and Doctor Olmo's Clone 4. As we mentioned in the last Newsletter, the known unknown this year was freight costs. Freight rates are always based on spot market conditions. If a lot of product needing refrigeration is going east from California, rates are higher. This can be usually weekly situation but it also can be daily fluctuation. At this time rates are about 25% higher than last year. One thing for sure, it is going to take at least another day to delivery of the fruit. There was a time during the last few weeks that it sounded and looked like the entire State was on fire. Around most of our grape growing areas that was not the case. One must remember these fires are in mountainous forest areas where population is minimal. They did create haze on some days that gave one an ominous feeling but there was no smoke or ash in the vicinity of the grapes that we pick. For the very first time we are on the way to receive orders from over 30 wineries from all over the country. With all the competition that there is in the industry from finished wine, juices and competitors here in California and from the Northwest, we consider our buyer base one of the strongest in the industry. Thank You!!! Hallelujah! Hallelujah!! We finally have our website back up again! It is redesigned and very mobile phone friendly. If you are in business, please make routine backups of your website and keep it safe. Hackers can easily corrupt code and destroy your website. It is predicated that we will have a large crop probably approaching 4.25 million tons. If so, it will be a record. This estimate is projected by Allied Grape Growers. However, bunch count and observations in the vineyards show an average crop. The record crop will be due to recently planted vineyards coming in to production especially for Cabernet Sauvignon. The demand by the public for Cabernet Sauvignon wine would appear to be insatiable—there are some cracks starting to show in that appearance. Record prices for Napa and Sonoma Cabs appear to be softening a little but still at outlandish prices. After visiting most of our vineyards, there is a general opinion that harvest will be later than last year, probably at least one week. This is good because last year we were very early with some varieties. We are currently having a heat wave, but it is cool in the evenings. Technically, it is ideal conditions for good grape quality. Veraison (color change) at this stage is very spotty and varies between vineyards. Currently, winery activity for those grapes that have no contract for the upcoming season is almost nonexistent. It probably represents less than 10% of the crop. This of course will change as the harvest approaches. Wineries are currently scrambling to empty tanks to make room for the new crop. Labor has been one of the biggest variables that affect pricing. It will also be a factor this year but transportation (freight) might be a bigger factor. Last year, shipping costs varied quite a bit during the season. An unofficial freight “no strike” period occurred during the middle of last season. Truckers were unofficially striking in response to the impending Electronic Logging Device (ELD) Federal requirements. This unofficial strike was a serious slowdown and drove freight rates higher than ever, as well as, increased shipping time. This spring refrigerated rates for 2018 were at times 50% higher than 2017. Those rates are now abating and hopefully will return to more acceptable levels. One thing for sure, with the ELDs now being used, deliveries will take longer. My wife and I enjoyed our most recent trip to Illinois, Iowa and Michigan. It is such a pleasure to visit customers and getting a certain amount of pride in the wines they are making from our grapes. I have tasted some excellent wines and am convinced that Eastern winemakers are making better “California” wines than their counterparts in California. We thank everyone for their hospitality that we visited. Hopefully, we would like to do this in the future for different parts of the country. We are in the process of starting to contact wineries to see what their needs may be for the upcoming season. We thank you, who have already placed their orders. It makes our job a lot easier to get your orders in as soon as possible, but we know a lot of you have to assess your own crop before making a decision. 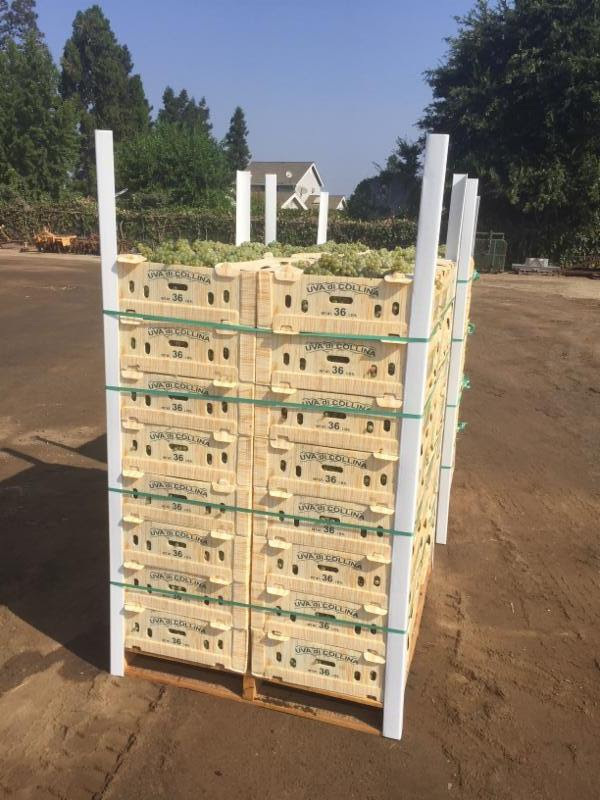 Currently the California grape crop looks average, with Chardonnay, however, showing a potential for a light crop. One thing for sure, it is not a bumper crop. Where it is appropriate, we are making sure our growers are shoot thinning. We are not seeing any mildew problem that was rampant at this time last year. This season has the potential for a good quality year. From the Wine Industry Network "ADVISOR", domestic Rosé is gaining market share from the French. For the third year in a row, all Rosé sales are increasing by 50%. According to Nielsen retail outlet data, the Rosé category grew 64% over the last twelve months. We consider Rosé a great potential source for growth for all wineries across the country. We have a wonderful source of "Old Vine Grenache" and other varieties for a basis of your Rosé. Last weekend we were in San Diego for the annual Wine Maker's Conference. We had a nice time and we always enjoy the Winemaker Tasting & Wine Sharing Party. At this year's event, there were new wineries from the Ramona Valley (east of San Diego) pouring wine. We tasted a lot of great wines from this new area, especially Grenache. Another one was a Falanghina wine made from Falanghina grapes (a white grape from the Campania area of Italy). It has great potential in this particular valley. On June 19th, we will be in Davenport, Iowa for The GrapevineMidwest Viniculture Expo. We will be in booth 521. We are looking forward to the Captain's Riverboat Cruise on the 20thand other events during the Expo. We hope to see a lot of our customers from the Midwest at this convention. Later in the week, we will be heading to Chicago for a little sightseeing and meeting other customers in the area. The Detroit area will be our last stay where we plan to spend a little time with family and again customers. Last year we successfully shipped Tannat grapes for the first time. This year we may have the ability to get some Teroldego grapes. This variety originates from the Italian red grape grown primarily in the northeastern region of Trentino-Alto Adige/Südtirol, Italy. The grapes produce deeply pigmented red wines with an intensely fruity character and relatively low tannins for early drinking. In our last Newsletter, we expressed a concern with a potential return of drought conditions and a very early maturing crop. Following that Newsletter, we have had several good rain storms. We escaped drought conditions but we did not get sufficient snow cover in the Sierras and total rain was below average. After the couple weeks of heat in February, we have had nothing but cool weather. This is delaying the maturity of all crops and the general opinion is we are two weeks later than "normal" with the grape crop. General activity for those grapes without contractsis slow. There was some early activity for all varieties but that disappeared. The varieties where there is still good demand are Chardonnay, Pinot Grigio, Petit Sirah and Cabernet Sauvignon. As the crop develops, we will hopefully see more activity. I am hearing that Zinfandel sales are starting to improve and we may see some strength in that variety.